Techcrunch reports that BlogBeat has been acquired by Feedburner. 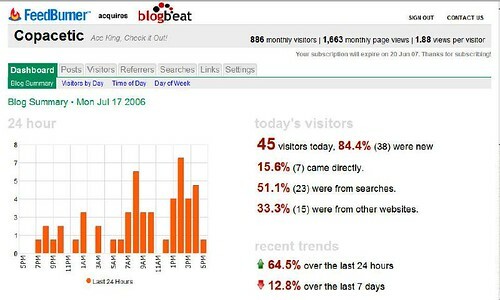 I have used BlogBeat for the past few months and love its simple and intuitive stats. Its also real-time unlike Google Analytics. FYI : Blogbeat is a stats package for bloggers that you can actually understand. Was the takeover amicable or hostile? I gather from reading about it and exchanging a congratulations email with the founder Jeff, that it was amicable. Did you compare them with Performancing? I’m just wondering, because I’ve been trying them out, and digging them, but I think I suffered from Blogs Analytics Fatigue before trying Blogbeat.